Take a pre-Christmas trip to Finnish Lapland and see the real Santa on his home turf. Children get a private audience with the bearded one, and there is plenty of time for fun in the snow, with husky sled rides, snowmobile jaunts, tobogganing and ice fishing all included. Lapland is one of the world’s truly magical places, where the snow lies deep and crisp and even, reflecting the shimmering wonders of the Northern Lights. It’s a place where anything seems possible and childhood dreams can become reality. 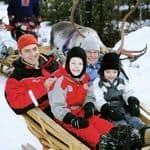 Create your own magical family memories with a two or three night Christmas Santa break in Santa’s Lapland, crossing the Arctic Circle into Santa’s secret homeland hidden deep in the snowy forest. The whole family will love the reindeer sleigh-rides, the excitement of husky sledding and snowmobiling, fun and laughter with Santa’s cheeky elves in the ‘Igloo Fantasia’ experience, and the glittering charm of this beautiful winter wonderland. 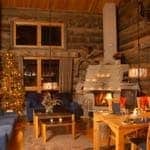 Best of all, you are guaranteed a private family meeting with the big man himself, in his hideaway log cabin deep in snowy woods. 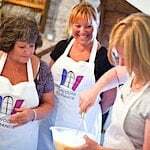 Our trips are extremely affordable too, with thousands of free places for children, and a choice of really lovely hotels and cabins to stay in. 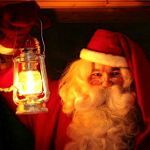 Choose from the traditional Santa’s Magic experience and the longer Santa’s Aurora (which includes an amazing Aurora Wilderness dinner and a stay in the luxurious Santa’s Star Arctic Hotel). 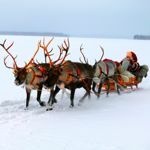 Find prices and more about how to visit Santa’s Lapland and don’t forget to watch our Santa Lapland video below.